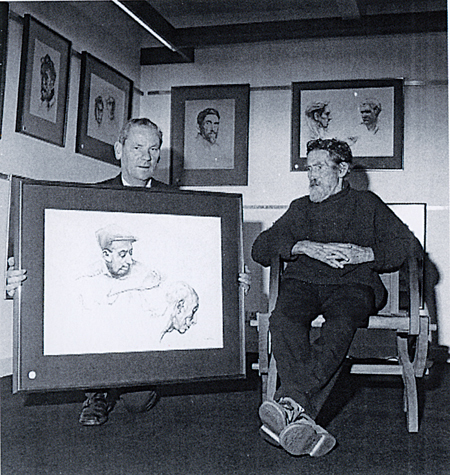 Des Kenny holding one of a series of sketches of Irish peasant faces, watched by the artist Seán Keating. In 1968 Des Kenny, a Galway bookseller, was preparing to open a commercial art gallery in Salthill, the first of its kind outside Dublin. He needed a star artist for its opening night. He made an unusual choice, and invited Seán Keating. Had he invited Keating 30 or 40 years previously he would have invited a giant of his trade. Then Keating was regarded as one of Ireland’s greatest painters who had, in large canvases, mythologised the fighting men of the War of Independence, and the builders and engineers of the great Ardnacrusha project; the harnessing of the Shannon’s energy to power the fledging Irish Free State. In 1968, however, he admitted to Kenny ‘ I am dead as far as the art world is concerned’. Part of Keating’s problem was he had shunned modernity, and had remained frozen in an idealised Ireland of romantic Aran fishermen, naive religious pictures, and square jawed fighting men. Later he saw the futility of the Civil War, followed by the new pinstripe suited types, (all of whom he dismissed as ‘droves of fanatical ignoramuses’ ), and included them in his later paintings. But he remained steadfast to the Ireland that he had long imagined. Des Kenny was a shrewd judge of an artist. He drove away that day with his car weighted down with sketches and drawings, and opened his Salthill gallery in triumph. Huge crowds came and all his pictures sold, as they did in two further Keating exhibitions. Suddenly, now in his 80s, Keating was rediscovered. His earlier work was eagerly revisited, and a sneaky admiration grew for his forthright honesty when confronted by modern art, which many people probably found equally difficult to comprehend. On a Late Late Show, Gay Byrne roguishly asked Keating what did he think of The Table, made by the renowned Swiss artist Eva Aeppli. Keating did not hesitate. He fired with all guns: ‘Its a horrible perversity, nightmare stuff...an old lady who had gone completely mad and is dangerous...I think it is morose...vengeful against the human race.’ Everybody loved what he said. \Sean Keating (1889 - 1977 ) was a Limerickman, who won a scholarship to the Metropolitan School of Art in Dublin, where he was befriended by William Orpen, a highly sought after portrait painter. Admiring Keating’s drawing skills. Keating later recalled ‘My life began the day he looked over my shoulder in the life class and said: That’s good. Go on -go on-go on.’ Orpen invited him to share his studio in London. At the outbreak of World War I Orpen offered his services as a war artist. He told Keating that he was comfortable in London, where had made a great deal of money painting society portraits, and felt some obligation to repay the country which had treated his so well. Keating, however, believing that fighting of some sort was brewing in Ireland elected to return home. In 1914 he had married May Walsh, a farmer’s daughter from Co Kildare, who immediately became both his muse and life’s companion who shared his socialist views. The Keatings began a series of visits to the Aran Islands and his best known work of that period is probably An Aran Fisherman and his Wife. Rather oddly, however, the almost life-sized painting was mainly done in Dublin. His brother Joseph and his sister Vera modelled as the fisherman and his wife. Keating wanted to portray the islanders as ‘intellectually engaged and hard-working, rather as a demoralised nation of peasants.’ Orpen loved his Aran paintings. Tom Kenny, son of Des, remembers the opening of the Salthill gallery well. It was during Race Week, and many invitees came in their racing finery. Two ladies, dressed to kill at Ballybrit, asked the slightly nervous artist on what sort of canvass he had created one particular picture. Keating looked at the sketch for a long time before replying that he thought it was all done on a ‘flattened out old brown paper bag’. NOTES: Published by the Irish Academic Press, magnificently illustrated, now on sale €29.99 paperback.